Are your natural stone floor tiles uneven? Is the overall surface of your marble or travertine floor not truly flat? 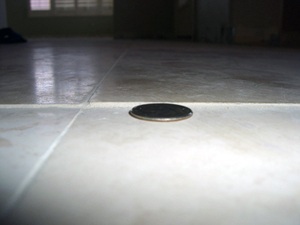 Does a coin placed on your floor look like the one in the photo? If so, it sounds like you have you lippage. And it’s not only unsightly, it’s a safety hazard. Just a small bit of lippage could cause a person to trip and fall. Lippage, a condition in which one edge of a stone tile is higher than adjacent edges, is usually caused by poor installation. That’s why it’s important to hire a qualified professional to be assured your floor is set correctly. An uneven substrate or the improper application of setting material are the main culprits. A proficient installer will flatten the floor first with a self-leveling cement or thinset to avoid lippage from occurring. If a tile is moisture sensitive, an epoxy setting material should be used so it does not absorb moisture and warp, which can also cause an uneven setting. Since creating a floor out of natural stone is an art, not a science, there are acceptable levels of unevenness, which are set by the American National Standards Institute (ANSI). However, these levels are quite small. For tile or natural stone, 1/32 of an inch, or about the thickness of a credit card, is the acceptable lippage parameter. If you do have lippage, don’t despair. The floor can be repaired—and you don’t have to rip out sections to do so. A Stone and Tile Pro Partner can ground the natural stone to a flat surface, then hone and polish to the desired finish.